Atari was in a bad way by 1995. They hadn’t achieved the sales numbers and install base to convince major developers (like Konami and Capcom) that developing for the Jaguar was going to be worth their time – what’s more, it was becoming clear that they never would. Still, the Jaguar needed software, so it was getting to the point that Atari would publish just about anything that ran game code when you pressed the power button. Enter Supercross 3D. I can’t imagine anyone at Atari honestly thought this game was ready, I think they just didn’t (and couldn’t afford to) care. Don't spend too much time up there. Big air doesn't win races. You won’t need too much imagination to figure out what Supercross 3D is about. You’ll control your third-person biker through qualifying, semi-final, and final heats in 14 different tracks across the USA. There’s jumps, bumps, turns, and other racers to contend with, but your ultimate goal is simply to place first in every race. A level of customization allows you to enter your name, pick your nationality and choose your racing club, but any differences between racers is purely cosmetic. The difference here is that this is a true 3D racer instead of the usual 2D scaling approximations. Textured polygons form the track, while your racer and your opponents appear to be 2D sprites derived from CG models. It’s a primitive step toward the freedom of a full 3D world, and it does indeed do away with the confusing visual artifacts of a 2D scaling solution. Unfortunately, the engine seriously underperforms on the Jaguar. Much like Sega’s Saturn console, the Jaguar was a 2D beast. This makes sense, as it was developed as competition to the Mega Drive and SNES – a role it actually fills quite handily. Unfortunately, the industry had changed drastically in just a few years. Doom had popularized the idea of 3D gaming, and Sony’s PlayStation embraced polygon engines with dedicated hardware. The Jaguar really wasn’t set up for this, but just like the Saturn, they tried to compete as best they could with software renders and various duct-tape methods to crunch polys. So, like Checkered Flag and Club Drive, Supercross 3D pushes the Jag in directions it seems ill-prepared to go. Framerate is consistently choppy, which is the biggest black mark against the game. Practice mode, where you hit the tracks solo, is manageable but still around 15 FPS. Races with other computer opponents dive the framerate down to about 5 FPS. I also had the sense that the game slowed further by the 3rd lap (memory leak? ), but that could be my imagination. Careful, that shade of brown just to the right means certain death. It could be rushed programming, since Cybermorph and World Tour Racing (for the Jag CD) would seem to suggest the console’s got the chops for this. Since racers are just sprites, I wonder if it’s adding extra AI that’s bogging down the framerate – possible proof that Tiertex pulled the cardinal sin of using the Motorola 68k as the sole processor instead of the dedicated GPU chips. But ultimately, where the blame lies is rather moot. And to be fair, you can indeed adjust to this framerate over time and still be able to play the game. But why would you want to? It doesn’t help when other racers, like Wipeout on the PSX, are dashing through polygon worlds without a single hitch. Even if you get past the framerate, there are more graphical issues to be had. Just like Val d’Isere Skiing, the only difference marking valid track is a texture. The rest of the arena is a similarly-colored flat, single shade. If you drive off into this area, you’ll immediately crash. The colors blend so well at times that you’ll really have to pay attention to track shifts, and choppy turns tripped me up more than a few times. Art also lacks variety. You have 14 locations that all take place in an identical arena with an empty blue sky. The layout changes, and the dirt differs between a few shades of brown, but that’s it. No weather, no unique crowds, no skyline or local flavor. The varying ways the track can change are limited as well, and each arena just seems to be mixing up the order of the same handful of turns and jumps. There’s also just not much to the game. Prior to each race, you can change your bike’s gears, tires, and shocks (idea being to match the hardness of your shocks and tires with the hardness of the arena’s ground), but this doesn’t have any truly discernible effect. You’re racing against other riders, but you don’t need to mind them. You’ll pass right through them in packed turns, and collisions or intentional nudges just don’t happen. Finally, there’s a “trick” button used to throw some moves during a big jump, but absolutely no reason to use it. You don’t get points for tricks, a speed advantage, or even a cheer from the crowd. It’s basically just a button to press if you get bored. 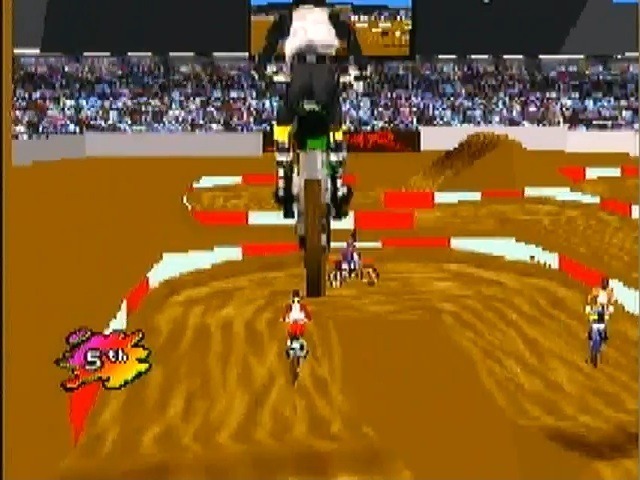 Supercross would actually be a pretty good-looking game if it weren’t for the framerate. The racer sprites look fairly detailed, the proceedings occur in full screen with minimal HUD interference, and I didn’t spot any moments of clipping or similar graphical errors. Having the race mirrored on the arena’s massive Jumbotron is a neat touch. Menus are a bit simplistic and overly “rad,” but easy enough to navigate and understand. Audio is also limited. 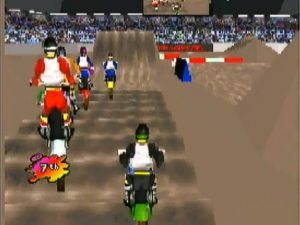 Music appears in the menus, but not during a race. Race audio is simply a couple different samples of a dirt bike’s engine, and it does at least seem to shift properly when you’re on the ground versus in the air. Controls are simple, with only brake and accelerate buttons to worry about. There’s no option for shifting gears, and the number pad isn’t used at all. Finally to note, you can save your progress to the cart after any race, which is always much appreciated. 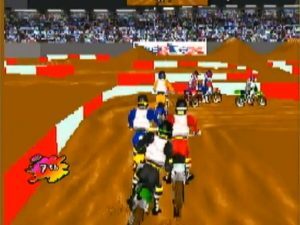 Supercross 3D is awfully light on content – 14 similar-looking arenas don’t impress, and there are no other games to speak of beyond the tournament (not even a hot seat 2-player mode). Still, it’s fun enough, controls well enough, and can be exciting enough that it would be an average to above-average game if it weren’t for the abysmal framerate. Supercross feels rushed out the door too soon, but then, the Jaguar would be officially dead in just a few months anyway. A 3D racer with clear advantages over similar sprite scaling games. Controls well. Looks decent enough. Terribly choppy framerate. Lack of variety in both arenas and game modes. They should have named this game “Supercross 3FPS”.